Here are some instructions on how to use this application. 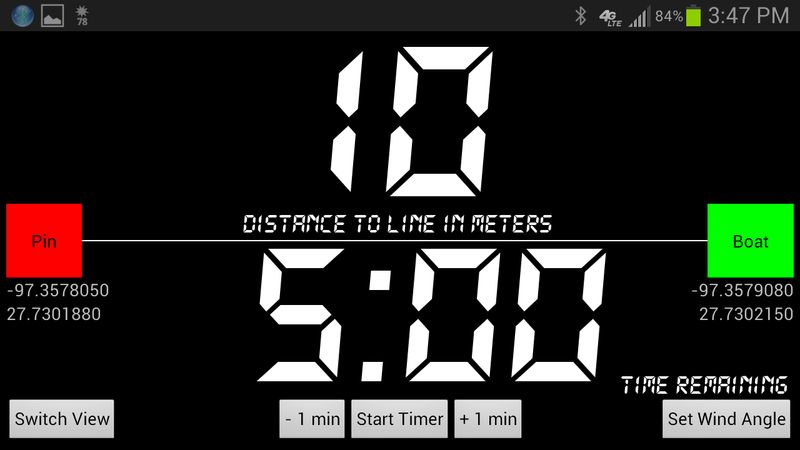 The starting view displays a distance to line calculation on the top and an adjustable timer on the bottom. When the timer completes, the view will be switched to the racing view. Switching between views manually can be done by pressing the “Switch View” button on the bottom left of the screen. Once the race committee has set the starting line, sail by each end of the line and “ping” each location. To ping the starboard end of the line, press the green “Boat” button. To ping the port end of the line, press the red “Pin” button. SailBot will now display (while in starting view) your distance to an infinite line extending through both ends of the line. Because the distance calculation is based on an extension of an infinite line extending through both locations, you do not need to sail right up to the boat or pin to ping either side. You can simply ping the line from an extension of the line by lining up the flag on the committee boat with mark on the other end of the line and touching the boat or pin button (depending on which side you are on) at that time. This allows you to ping the line while staying out of the way of other fleets’ starting sequences. The racing view displays speed and velocity made good (VMG) to the wind side by side on the top and course over ground on the bottom. The racing view will also show only speed or only VMG on the top by “long pressing” either the current speed or current VMG readout respectively. The application saves the most recent racing view configuration that was enabled, and can be returned to the previous state by “long pressing” the single speed or VMG readout a second time. To set the wind angle for the VMG calculation, press the “Set Wind Angle” button on the bottom right of the screen. This will pop up a number picker in the center of the screen for manually setting the wind direction. Hide this number picker by pressing the same button that now reads “Hide Wind Angle.” Please note that the VMG readout is an absolute value of the VMG and will therefore read positive both upwind and downwind.